Blind Dog Entertainment presents "An Inside Look" with in-depth interviews, swords and whips, movie cuts, show clips and stories of laughter and pain. 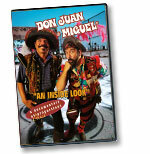 This zany documentary brings to light the madness and magic that goes into creating the Don Juan and Miguel Show. "THE BACK STAGE PASS" gives access to the behind-the-scenes happenings of an actual festival day. This collectible DVD even includes a sneak-peek of their upcoming film "I SENSE DANGER!" A must have! Linda Demian Granados  as Herself.